Ella Linkin is a Navajo woman who smiths silver in the Traditional Revival style. She has a nice eye for design and uses fine natural stones in the work that we get from her. 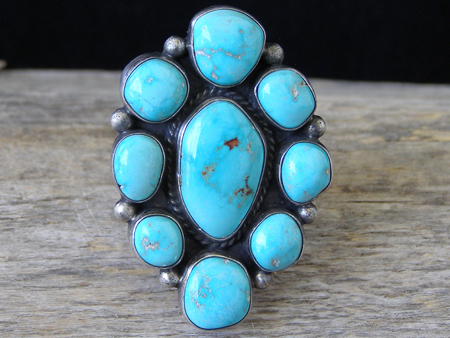 This stunning cluster ring is set with nine stones of Lone Mountain turquoise. This is natural, untreated Lone Mountain turquoise from Nevada which was mined and cut in the 1960's. The stones are set in smooth bezels and the center stone's bezel is wrapped with twist wire. Raindrops are interspersed between the stone settings along the edge of the ring face. The ring's shank is formed from a length of half-round wire which was split into three narrower bands before attaching to the ring back. Sensational color! This ring bears no hallmark. Stones: center 3/4" x 7/16"; 8 stones ranging from 5/16" x 1/4" to 3/8" x 3/8"
Dimensions of ring face: 1 5/8" x 1 1/8"
Width of shank in back: 1/8"